$40 advance; $45 day of show. 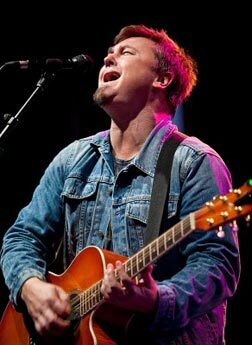 Called the great American romantic by the New York Times, Edwin McCain has built an enviable career over the past 20 years by balancing his massive pop success with the year-round touring schedule of a tireless troubadour. His hit songs, authentic spirit and surprisingly affable sense of humor keep fans coming back time and time again for nights that feel more like parties with old friends than rock concerts. After recording two of the biggest love songs in the history of pop music, McCain now performs upwards of 100 shows annually throughout the US as a solo artist, with his full band or his acoustic trio. Recently, hes added orchestras to his repertoire, performing with symphonies in select markets where he brings his powerful songs to majestic new heights. Those enduring love songs (and wedding must-haves) Ill Be and I Could Not Ask For More arent just for the romantic at heart; American Idol and The Voice contestants turn to Edwins ballads every single year to help them win over judges and fans alike (just ask last seasons AI winner, Nick Fradiani). Even Justin Bieber has been known to belt out Ill Be during his own concerts. Earlier this year, McCain suddenly found himself with a whole new crop of fans when his Flipping Ships television show debuted on Animal Planet. Flipping Ships took him from the chart tops to the boat shop - his very own Boats Have Souls, a restoration outfit dedicated to bringing life back to vessels and customizing them to perfectly fit their new owners. We started the business to put good boats into good families hands by restoring them in ways that might otherwise be financially out of reach, Edwin explains. Viewers were fascinated by the blood, sweat and the occasional tear that he poured into his renovations while rehabbed boats found new life and new owners, including a few non-profit organizations in his homestate of South Carolina. Just like his songs, Edwins boats all have a story to tell; about the people who built them, Edwins team who defies all odds to reconstruct them, and the families who take them home. The Bull Run is a full-service, farm-to-table restaurant in a pre-revolutionary tavern, located about 35 miles NW of Boston, with plenty of free parking and rustic, old-world charm.